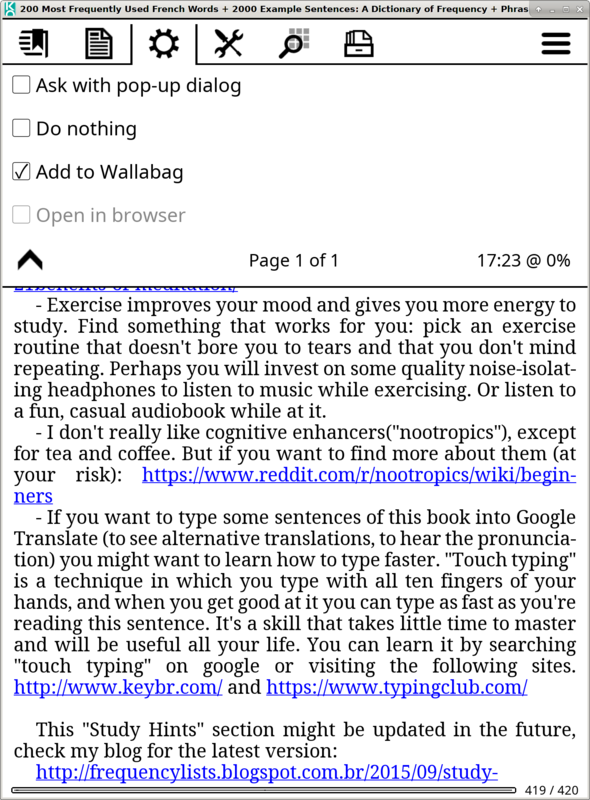 Offers a choice when Wallabag is available. Offers a choice when relevant, i.e., on platforms that support an external browser. Forgot to add the menu item to set this setting? Or just undocumented for now? I copied this from ReaderStatus. I wouldn't have put the settings in yet if I'd written it from scratch. If there's no cleaner way, at least if Device:openLink() ~= false then ? Not defining it as no and testing Device.openLink? Dunno. Is there already functions not defined in generic/device.lua that are defined in others? I thought the idea of them being no was some kind of API listing everything that can be available. Or add Device:canOpenLink = yes|no ? I think it's mainly that you can safely call it and be sure it won't crash. API listing is more like a happy side effect. Not fond of the url inside ' ' on the screenshots. Can't you just let it plain? I added a new menu item to the Links submenu. Looking at the screenshots below I realized it might be redundant with that ignore external links thing. 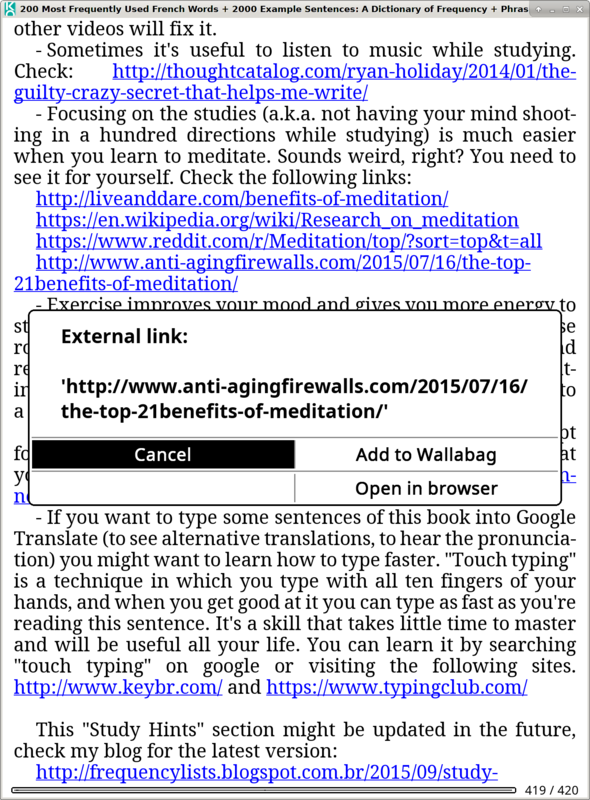 I think it should be just below Ignore external links (as the swipe gestures currently ignore external links). Or merged with it (but then "Ignore" instead of "Do nothing"). 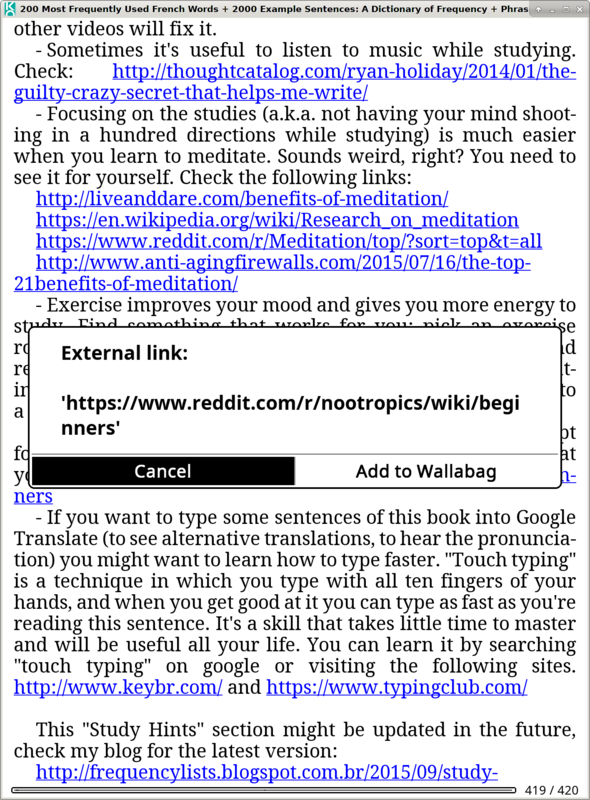 But on my Kobo with wallabag not enabled, it just serves as ignoring Wikipedia article links in Wikipedia EPUB for easier page change with Tap. -- clear that cache when page layout change). and a bit of tweak at the end of ReaderLink:onGoToPageLink() to not do the xpointer checking when there is none but a uri. 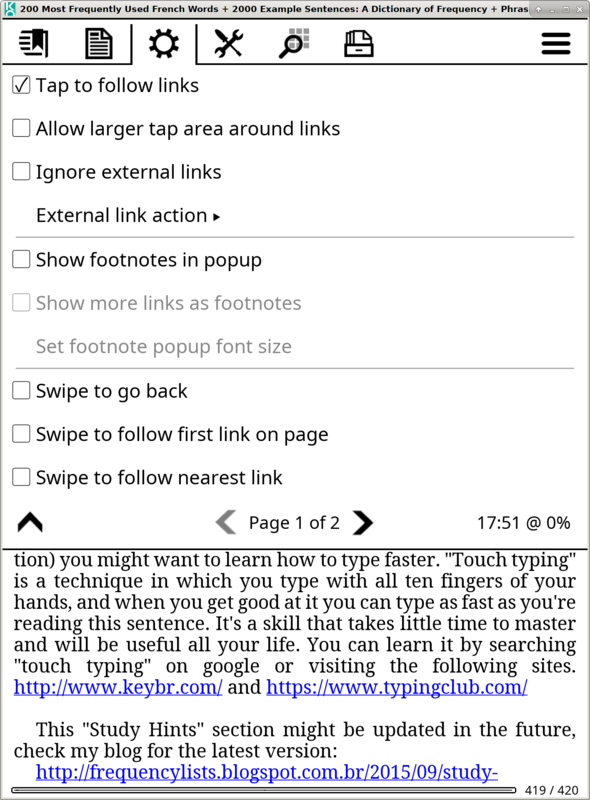 In Wikipedia EPUB, small footnotes are hard to tap on, and may be sitting just between 2 wikipedia URL links. Chances of taping ot swiping on it would be very low. Having avoid external links available makes that a non-issue. May be give that External link action some enabled_func like if self.ui.document.info.has_pages or not isTapIgnoreExternalLinksEnabled? (Except that now, that menu has 11 items and spans 2 pages :) I'll probably kill "Swipe to follow first link on page" as I don't see why one would use it since we have "Swipe to follow nearest link"). 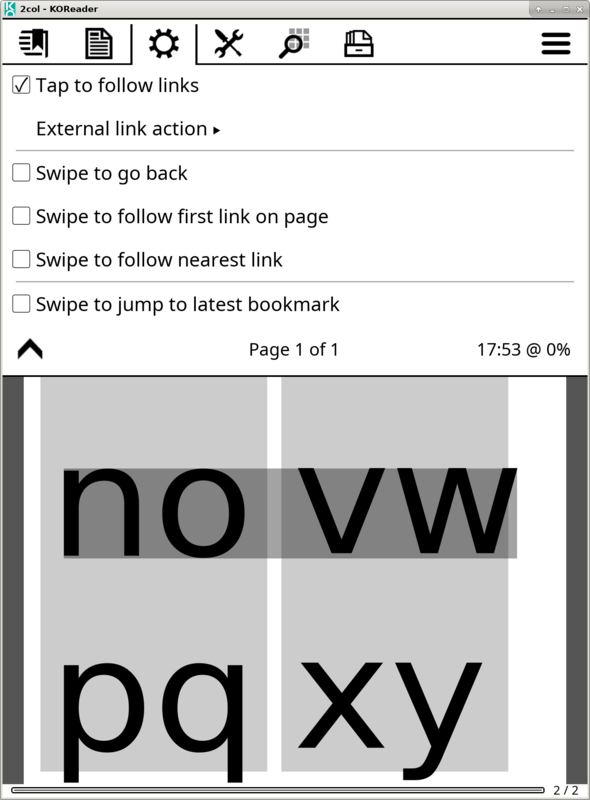 I've been looking at this to see how we could merge Ignore external links into the added External link action> submenu (and adding the selected action text into the main menu text). I wondered if we should keep both "ignore" (let the tap propagate) and "do nothing" (eat the tap, don't propagate). But after some time, I just wonder if this menu is really useful with all the actions. I guess most will choose only "ignore" or "ask with popup" - just to see the url before getting into the wallabag wifi popup and download, or launching an external browser. These are just one tap away anyway. We could be just fine with the existing single checkbox Ignore external links: if checked, let the tap propagate to change page or find an internal link near - if unchecked, just show the popup with the available actions? I'd never choose "nothing" and I don't think add to Wallabag makes all that much sense as a default, but I can definitely see opting for "open in browser" without disabling the Wallabag plugin. Or if we were to keep it, it may be better to have it as a real submenu with various combinable items, instead of an alternative single choice one. it may be better to have it as a real submenu with various combinable items, instead of an alternative single choice one.